Last, but certainly not least, we conclude our reports from the Making the Medieval Relevant Conference with a talk given by Dr. Turi King, the Canadian geneticist who confirmed the skeletal remains of Richard III found in September 2012. King discussed some of the more humorous circumstances surrounding Richard’s discovery, the science behind the dig, and the media onslaught that ensued. King is currently working as a post-doctoral researcher in the genetics department at the University of Leicester. Finding Richard wasn’t without its trials and tribulations. What was initially supposed to be a two week preliminary dig, turned into a two and a half year odyssey for King and the team. While there were numerous books, and a documentary, that recorded the two year long process from the parking lot in Leicester to the genetic match between Richard III and two modern day descendants, King shared with us what the cameras didn’t capture: personal reflections, the way the find impacted her life, and some of the bizarre things she had to deal with once the discovery went public. Richard III: What Were We Looking For? 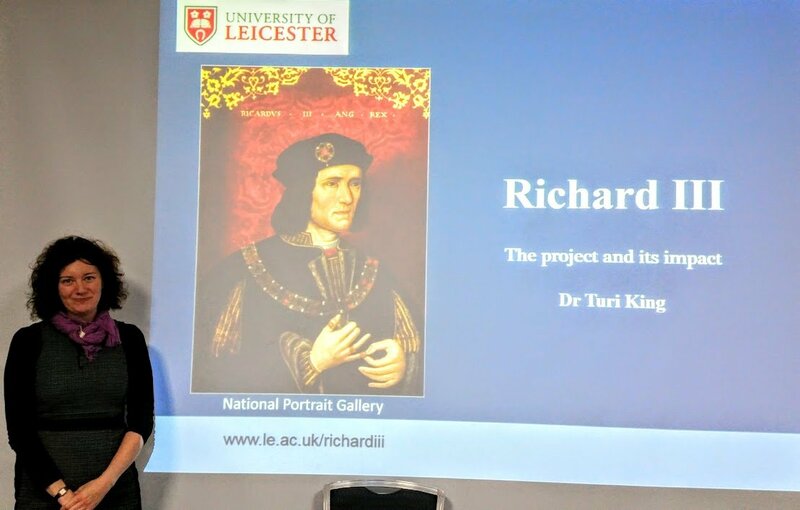 Philippa Langley, secretary of the Scottish branch of the Richard III Society, and the Leicester City Council, managed to raise funds to support a dig to try and locate Richard’s remains in Leicester – his last known burial location. Once a team from the University of Leicester had been cobbled together, they decided how to go about searching for this long lost king. They established that they were looking in the choir of the Greyfriars in Leicester for a man who was thirty-two years old when he died and who had possible scoliosis. Basically, this was a historical missing persons case. Rumour, conjecture and local folklore all complicated the search, as many people had different theories as to Richard’s whereabouts. In 1538, during the height of the Dissolution of the Monasteries, the location of Richard III’s grave was obscured after he was buried in the Greyfriars church. In 1610, cartographer John Speede (1552-1629), described Richard III’s grave at the church, as ‘overgrown with weeds’. Using a combination of primary sources, old maps of Leicester, and ground penetrating radar, they got to work hunting for Richard. They put in two trenches, and began to dig thinking there was no way they would find him. In fact, head archaeologist Richard Buckley famously repeated that he’d eat his hat if they found Richard. At the end of the dig, Buckley kept his word: the dig team made a cake in the form of a hardhat for him to eat! On the first day, they found medieval walls fairly quickly, along with choir stall footing, a stone coffin, and the south and north wall of the Greyfriars church…and human remains! King noted that they had to be careful; they only had a license to bring up six remains so they had to be smart about which ones to select, should they find anything. What they didn’t realise at that exact moment, was that they had found Richard III on the first day! This became apparent as they uncovered more of the body and saw that his spine was curved. When the Victorians turned the church into a school in 1863, they all but missed the body by 90mm and Richard’s head by 1mm! It was sheer luck that Richard’s body hadn’t been destroyed. King recounted how television crews had parked their cars on top of where they found Richard before anyone knew he was down there. Contrary to popular belief, and media speculation, “R did not mark the spot!”. King recalled the moment when she believed that it could actually be Richard III. Never in her wildest dreams did she think they would find him on their first attempt. Once they had Richard’s remains and were ready for testing, King had them sent to two different laboratories make sure the results were accurate. They did manage to determine the lethal blows that felled Richard at Bosworth; 7cm of brain was exposed when the base of his skull was taken off. There was also another smaller wound. These two combined were the killing blows but they are not sure which one Richard took first. The team employed radiocarbon dating to determine the age of the skeleton, and also noted that he had a diet high in protein, in particular, one high in fish, meaning he ate food that was reserved for someone of a higher social class. King turned to the female line to find potential links to Richard to verify his identity, as any deviation in the male line through infidelity would render their search futile. The person they selected was another Canadian, Michael Ibsen, who was a descendant of Richard’s older sister, Anne of York (1439-1476). Ibsen just so happened to be living in London, England as did Richard’s British descendant, Wendy Duldig. DNA degrades after death, if there was anything left at all, she had to look for mitochondrial DNA. It was a delicate process, King said, “You have to be careful handling it, if you breathe on it, you can contaminate the DNA.” Luckily, their DNA match was an extremely rare type so it was solid proof. However, King was quick to point out that, “DNA evidence is not a “silver bullet”, it’s just another strand of evidence.” King used Bayesian Statistical Analysis to bring all these strands of evidence together to come to a conclusion, and until the end, they were very conservative in their approach. While the investigation into the veracity of Richard’s remains was underway, King had to keep everything she knew a secret. Media interest in the story was immediate and intense. There was an incredible amount of pressure from the press and the public. King realised this was a game changer for her – one misstep and it could end her career. She still had to complete the entire genome sequencing before she could publish her work. It was extremely difficult, and mentally taxing, to keep a secret of this magnitude from close friends and colleagues, but if anything leaked, she would never be able to publish her work. The University of Leicester agreed to do an announcement before the findings were reviewed because of the amount of media pressure involved, but until that point, everything had to be kept tightly under wraps. King had to stop answering invasive calls from people trying to find out information before it was ready; it was an incredibly stressful period. King said that in these situations, ‘one finds out rather quickly who their real friends are’. Adding to the fair-weather friends, general chaos and media whirlwind, were some bizarre situations that came out of Richard’s discovery, such as people sending unsavoury items in the mail as “DNA samples”. King remembered receiving a crumpled envelope with a dried out swab in it. Someone had swabbed their mouth and sent it to her for testing. This was on the rather tame side, people have sent her other revolting bits of themselves in the mail hoping that it would prove they are related to Richard III. King didn’t let it phase her, this kind of investigation brings all sorts of people out of the woodwork. She laughed it off and understood that it comes with the territory. King is currently giving talks about the Richard’s discovery and continues to work at the University of Leicester.